Beethoven: Symphony No. 3, 2nd Mvt. Kathryn Greenbank, Principal Oboe of the St. Paul Chamber Orchestra, plays and discusses the solo from the 2nd movement of Beethoven's Third Symphony. 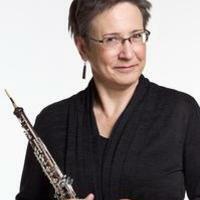 Kathryn Greenbank has been Principal Oboist of The Saint Paul Chamber Orchestra since 1982. She is a graduate of the Curtis Institute of Music, where she studied with John de Lancie. Her other teachers include Louis Margaglioni, Richard Woodhams, and Richard Killmer. Greenbank is a frequent soloist with the SPCO and has been featured on many of their recordings including Ravel’s Le Tombeau de Couperin, Stravinsky’s Pulcinella, and Dvorak’s Serenade in D Minor for Winds. Greenbank and the SPCO gave the world premiere performance of American composer Jennifer Higdon's Oboe Concerto, which was commissioned for her by the Minnesota Commissioning Club. Greenbank has played with the Philadelphia Orchestra, Boston Symphony, Orpheus Chamber Orchestra, Kansas City Symphony, and Kansas City Chamber Orchestra. She has performed in many chamber music festivals around the country, including the Marlboro Music Festival, Aspen Music Festival, Grand Teton Music Festival, Sarasota Music Festival, Alpenglow Chamber Music Festival, Grant Park Music Festival, Salt Bay Chamber Music Festival, Music in the Vineyards, and Music@Menlo, where she is featured on their CD The Unfolding of Music II. This past August, she was involved in a project recording the six Trio Sonatas of Jan Dismas Zelenka. Greenbank served on the faculty of the University of Minnesota, and continues to maintain a small private teaching studio. In addition, she has coached and led master classes for the New World Symphony. Beethoven: Symphony No. 3, "Eroica", 4th mvt. Bartok: Concerto for Orchestra, 5th mvt. ; Beethoven: Third Symphony, 3rd mvt. ; Brahms: Fourth Symphony, 1st mvt.